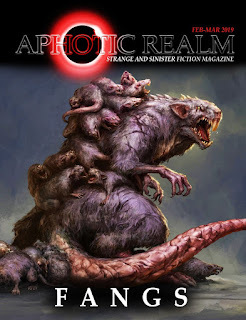 Aphotic Realm are back with their sixth issue which also marks their two year anniversary! I've been reading this magazine right form the beginning and each time they really deliver! In this issue there's a really great interview with the undisputed king of horror; Adam Nevill. A really cool feature article by Toni Miller from the amazing Ladies of Horror Fiction Team. Also featured is a fang inspired comic called Black Dog, and some great work by Russell Dongjun Lu. You won't find tales of Vampires inside here but you will find creepy animals and critters waiting to jump out at you! I have to say as usual all the stories in here are brilliant, there's something in here to scare everyone, I loved them all. Black Fur, Red Fangs by Kenneth Tilford kicks off this excellent anthology with a great American horror flavour. I really enjoyed this tale there was a great atmosphere of dread and foreboding terror in this tale where night time creatures take aim at an isolated community. I really loved The Waiting Game by Kev Harrison this was a really dark tale that I loved from beginning to end. A really original choice for a fanged creature! Liam's pissed off his girlfriend and he's going to really regret it. 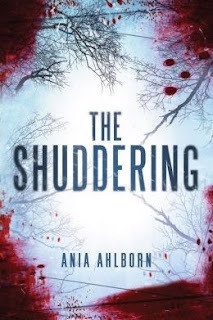 Really well written with a really cool ending, gory and fun! Then there's my story, Mother's Ruin by S.J.Budd. Trey and Damon think they have found a easy prey in the new boy at school who's just a little bit weird. But don't they know it's the quiet ones you have to watch out for. Infestation by Chris Martin builds up the fear straight away by setting his story in the middle of nowhere. A farm is devastated by an unusual infestation. Soon its not just the farm David Chapman has to worry about but the survival of him and his family. It's been a really long time since I read something as original and WTF as Her Special Sauce by Joanna Koch. It pulls you in from the very first sentence and doesn't let you go. Beth's come up with a novel money making idea and nothing is going to stand in her way. A monastery set high on mountain deep in jungle is a place of great pilgrimage but it hides a dark secret. Taranto by Michael Carter explores how far people will go to protect their secrets in a really creepy way of course! If A Murmur of Shadows by Tom Over doesn't strike fear in your heart at the thought of nature taking revenge against us for climate change then nothing will, unless there's a real life apocalypse. A brilliant tale with a very powerful ending. And lastly, Two Weeks to Wolf by Christopher Stanley. Not even powerful weapons like guns can save us from the wild creatures that stalk us. Some things are best left undisturbed. "Bram Stoker and Oscar Wilde join forces to face a vampire cult determined to open the gates of hell." Now this book had me intrigued with only the byline on the cover. I'm a huge fan of the gothic classic Stoker's Dracula and Wilde's Picture of Dorian Gray and if you are too, you will love this tale. Years before either becomes a literary legend, Bram Stoker and Oscar Wilde must overcome their disdain for one another to battle the Black Bishop, a mysterious madman wielding supernatural forces to bend the British Empire to his will. With the help of a European vampire expert, a spirited actress and an American businessman, our heroes fight werewolves, vampires and the chains of Victorian morality. The action will take them to dark forests in Ireland, through the upper-class London theater world and culminates in an exciting showdown at Stonehenge, where Bram and Oscar must stop a vampire cult from opening the gates of Hell. I absolutely loved this book and upon writing this review I can't think of anything bad to say about it. Stoker's Wilde is a brilliant book, its clear the authors really know their subject matter. The characters of Bram Stoker and Oscar Wilde are really believable and their opposing natures compliment each other really well. There's some great comic moments between these two. I really liked both characters but Wilde was by far my favourite. This book felt so real as I read it and I felt like I had come into a secret knowledge over how the two great books of Stoker and Wilde came to be written. The references to their works and lives are very clever. In the same spirit of Dracula, this novel is written through letters of correspondence, journal entries and recordings carefully put together in one collection by the mysterious White Worm society. 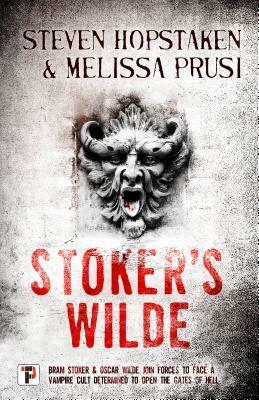 The tale of Stoker's Wilde starts off in Dublin when Stoker and Wilde are forced to unite against a werewolf wreaking havoc in Ireland. It was meant to be the adventure of a lifetime but for them it is only the beginning. Soon they are drawn into the affairs of a secret vampire cult in London and must work through their differences if they and their loved ones, and also the whole world, are to survive the Black Bishop. This book is great fun and doesn't take itself seriously, it will appeal to anyone who loves adventure stories, secret societies Victorians, vampires such as Dracula, The Picture of Dorian Gray, supernatural creatures, things that go bump in the night and the wit of Oscar Wilde. I'm itching to re-read Dracula and The Picture of Dorian Gray but the dilemma is which one to read first. "Antartica. A mining base at the edge of the world. Anders Norvelt, last minute replacement as head of security, has no time to integrate himself into the crew before an act of sabotage threatens the project. He must untangle a complex web of relationships from his position as prime suspect. Then a body is found int he ice. Systems fail as the long night falls. Now Anders must do more than find a murderer. He must find a way to survive. 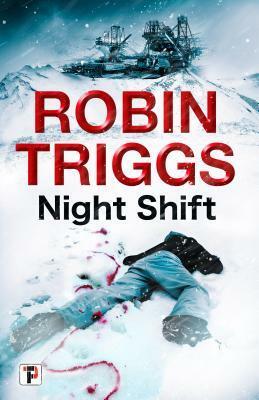 Will anyone endure the night shift or will ice and frozen corpses be all that remains." I was given this book by Flame Tree publishing in exchange for an honest review. I've loved each book they've sent me which are all horror/supernatural which is absolutely my thang! But when I realised this book was science fiction I was instantly put off. However I really loved this book, it only took me a day to read it. I would actually classify this as a dystopian thriller with a thin element of science fiction. Robin Triggs does a great job of writing a book full of mystery and intrigue. I love a great "whodunnit" and had a great time trying to figure out who the saboteur was before Anders did. The plots moves rapidly, I couldn't put it down. I'd love to see this made into a film. I really liked the writing style and I think fans of Harlan Coben will love this book. I would have liked to have seen a bit more back story but the author has stated that he has planned this to be the first in a trilogy and if that happens this is a great first book in the series. It's with great pleasure to announce that my short story, Mother's Ruin, will be appearing in Fangs by Aphotic Realm. There's a stellar line up for this edition featuring Marcello Bondi, me!, Michael Carter, Kev Harrison, Joanna Koch, Chris Martin, Toni Miller, Christopher Stanley, Kenneth Tilford and Tom Over. 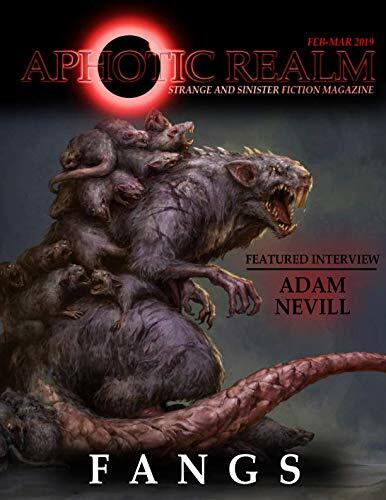 It also features an interview with the absolute horror legend who needs no introduction, Adam Nevill!!!!!!!!!!!!!!!!!!!!!! It's such an honour to grace the same publication as him. 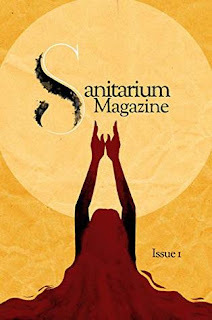 I was beyond excited to see last year that Sanitarium Magazine was being revived. I loved the magazine in its first life. It has a special place in my heart as this was the magazine to give me my first story acceptance at a time where I was beginning to lose all confidence in my writing. I was first published in Issue 28. I'd bought 5 copies! I was nervous as I had never read it before but immediately loved it and continued to buy every issue afterwards until it stopped at issue 51. I was devastated. Its always so sad to see such a great magazine go but like with most indie horror presses they are run on love for horror not for profits. And amazingly I got another story acceptance from the new version of Sanitarium I was thrilled beyond words and after reading the first issue I am also very proud to be featured alongside such talented writers. To call this a magazine is a huge understatement. This is a great and vast tome of horror. Seriously there wasn't one tale I didn't enjoy in this. This magazine/tome has really reignited my love for horror. For me I much prefer short horror fiction. I feel in this format there are less rules and restrictions in creating tales. You can push it as far as you want. You can be really mean to your characters as readers don't expect a big pay off at the end. In horror novels there tends to be a sense of hope and salvation at the end, but in short fiction that dream is decimated. With this I was genuinely excited each time I started a new tale as each one before it had been so good!. There's 20 tales in here, some touch upon poetry, science fiction, history, folklore and just plain weird! This was a very hard choice to make but my two favourite tales, (couldn't pick just one) were The Slaughterman's Tale by Dan Soule. I just loved this, so creepy from the get go and really chilling from beginning to end. I also loved The Mouth that Opens by Logan Noble it really reminded me of American Horror Story at it's best. Two writers I'll be keeping a look out for in the future. I hope to see a lot more of their work. Also up there is The Alchemical Wedding by Max D.Stanton. I've never read anything like that before! Mad and brilliant! This is a superb debut and if the second issue is anything like the first this will soon be a huge name in horror once more. The only downside is the wait for issue 2! 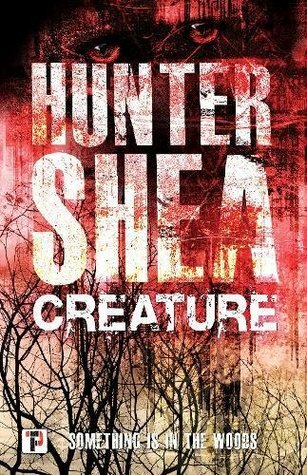 This is the first book I've read by Hunter Shea. I was slightly apprehensive about reading it as I had been aware of all the hype and praise surrounding this book. I was worried it wouldn't live up to my high expectations of a creepy horror tale. From my point of view I would describe Creature as two books fused into one. The first book is a body-horror tale that felt a little too real for me. It details the lows and lows of a passionate married couple, (with a great sense of humour) fighting against the wife's auto-immune disease which completely dominates their lives. This section terrified me, like everyone else, I have a terrible fear of falling ill in such a way. I guess it will happen to us all in the end but to see it so up close is truly monstrous. Parts of this book were so hard to read as we've all had someone close to our hearts suffer in such a way. I really felt for Andrew, he'd do anything for Kate but he's powerless against such as disease. It was only after finishing this book that I found out that the the author's wife suffers from a illness which made it all the more raw, heart wrenching and real. Most horror stories are outlandish separated from our everyday lives, usually set in circumstances you know would never happen to you in real life, but this one is very different. This could be you the illness creeps up on. It could so easily be your marriage, your family, that is tested to its limits. The second half of the book is much different. This is where the much anticipated creature makes an appearance. Where the fun begins. I have to admit the first half of the book is a slow burner, so much so that I hate to admit it now, but I did abandon the book to read something else. Eventually I came back to this, and am so glad I did as my investment of time was truly rewarded. So when they arrive at the cottage deep in the woods of Maine, (my favourite horror setting!) I was really excited for the fun/murder/destruction/bloodshed to start. I do love these sort of books where you know there's a big terrible monster and its going to come in and kill everyone. What a lot of people don't appreciate is that to slay this much overdone trope, you have to write it really well and bring something new to the table. Hunter Shea has done just that. From this point the book accelerates really quickly, it's really hard to put the book down and I was hooked. When I wasn't reading it, I was thinking about it! 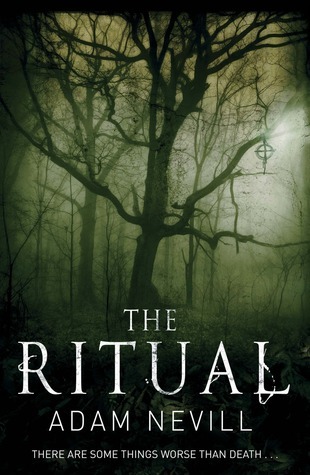 Whilst I've still got your attention, if you liked this books then may I also recommend The Ritual by Adam Neville and The Shuddering by Ania Ahlborn, both great books! After losing his mother to a brain tumour, Trevor King feels totally alone in the world. Someone needs to pay for her death and Dr Mellick, Trevor's work colleague and family GP, is the man he holds responsible. Trevor's yearning for vengeance leads him to concoct a vicious plot to frame the doctor for multiple murders. Trevor skins the corpses, turning them into elaborate art pieces after being inspired by a mysterious textbook. But as the skins of the flayed victims come to life and continue the killings for him, Trevor wonders whether he is in too deep.When Dr Mellick goes missing Trevor becomes convinced the doctor is planning a similar scheme to bring him down.But as Trevor discovers the truth of his mother's death and his own life, this murderous path becomes more of a calling. Morgan K.Tanner first came on my radar after reading Tales From the Realm Vol 1 by Aphotic Realm which featured his amazing story, The Almost Cannibal. That story really stuck out for me despite being in an anthology of really superb stories. His writing blended perfectly dark horror with comedy, I've read a few of his interviews and he's a really funny guy. 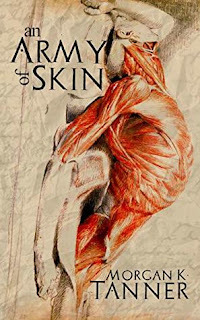 So when I saw that he had released his debut novella, Army of Skin, I couldn't wait to take a look. I think its worth mentioning the cover, designed by M.R. Tapia. It's amazing! It's really representative of the care and artistry that's gone into making this outstanding book. This book is an example of why I love novellas! From the very first page I was hooked and knew I was in for a fun ride. I read this in one day and was completely enthralled throughout. There's no boring back story just action. The plot moves really quickly in ways you can't anticipate. This is the tale of Trevor King who is seeking revenge against his late mother's doctor. He delves deeper and deeper into hell in his attempts to bring Dr Mellick to justice. The weird thing about Trevor King is that he comes off as a nice guy, but he does these terrible things which at times makes for uncomfortable reading. The characterisation is brilliant as you watch Trevor descend into utter madness. In this book, no one is as they seem. Its hard to talk too much about the plot without giving away spoilers but it's exhilarating. The ending is truly amazing, everything really comes together in one almighty final chapter! Whilst reading this book I had many questions but they were all answered in the very brutal ending. Morgan K.Tanner shows that he can make people laugh with one hand and completely terrify them with the other. This is an awesome debut and I can't wait to see what he writes next!